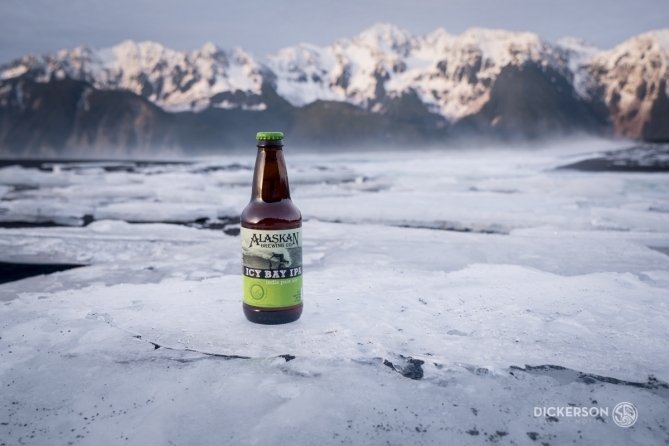 In addition to the individual beer videos, Alaskan Brewing asked Scott to create a video that captured the feeling of Alaskan winter and how their beer would beer enjoyed in that context. The video took Scott nearly a year to complete, due to unfavorable winter conditions. He started working on it in the late spring of a terrible snow year, so he had to wait for the beginning of the following winter to film the opening shot. The video opens with Alaskan Brewing beer siting in a snowbank as snow falls onto it. The scene was created in Scott’s driveway, where he used a shovel to shower the beer with snow. Thanks to Sergey and friends who provided epic winter action footage, the video celebrates a day of skiing in Alaska. After their fun, a group gathers back around a bonfire to drink Alaskan Brewing beers. Scott found the most efficient way to gather a crowd of people to shoot the video was to mention they would get to drink the Alaskan Brewing beers that would be there as props. Dan Redfield with Hybrid Color Films edited the video to bring all the components together.